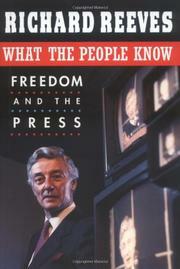 Veteran journalist and author Reeves (Running in Place, 1996; President Kennedy, 1993; etc.) reports on the state of the press (print and television). He is guardedly pessimistic. Reporting the news was once a fairly simple and, for Reeves, exciting and honorable task: get the story, get it right, report it. Today, however, journalism “is in a crisis of change and redefinition.” The reasons for this crisis are complex and interrelated. Technology, particularly the Internet, has made information instantaneously available to just about anyone. How do older media like newspapers compete? The answer has become to report on what the public wants; find out what attracts people and feed it back to them. And what the public wants increasingly is short, untroubling entertainment. So we get coverage of scandals, entertainers, health tips (“evening news without news”), while more important events go underreported. Between 1992 and 1996, for instance, network television reporting on foreign stories, measured in minutes, dropped by almost two-thirds. Exacerbating this move toward news-lite is the concentration of media ownership in the hands of a few huge corporations: Westinghouse, General Electric, etc. News operations are minuscule parts of such corporations, but they are not immune to the corporate demand for profits. How does news make a profit? Give the public what it wants. Finally, journalism itself is in part to blame for its own predicament. In its post-Watergate zealousness to portray all politicians as crooks and all politics as corrupt, it helped create a public mood of cynical lack of interest in public affairs. Despite these problems, all is not lost. Reeves sees a continuing role for journalism, and that is simply to tell what “you and I need to keep our freedom—accurate timely information on laws and wars, police and politicians, taxes and toxics.” Much of what Reeves says is familiar, and the pieces don’t always hold together, but in the end he gets the story and gets it right. Nice reporting.